Student presentations starts at 13:00 on Monday the 4th. The format is 5×10 – 5 minutes of presentation, followed by 10 minutes of Q&A from the Jury. The presentations are taking place in 4 rooms concurrently, each room being supervised by a member of faculty. Audience is welcome, but will take their seats further back in the room and not disturb the proceedings. Jury and presentation supervisors gather in E22 at 12:30 for a quick brief before we start. The student’s game trailers are available on our YouTube playlist! Do note: the jury feedback does not affect student grades. 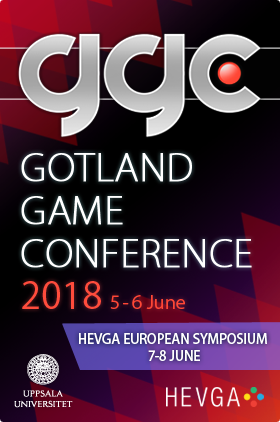 The Gotland Game Conference is not mandatory for the students, and not a formal part of any course.